Tiny electrical charges surge through the brain as billions of brain cells communicate with each other every day in an orderly fashion. But, when there is a sudden electrical energy burst a seizure occurs. And when it repeats itself, the disorder is called Epilepsy. Nearly 300,000 American children under the age of 14 have epilepsy. For a portion of that group it will be temporary, for others a life-long health concern. According to the Epilepsy Foundation: seizures are a symptom of epilepsy. 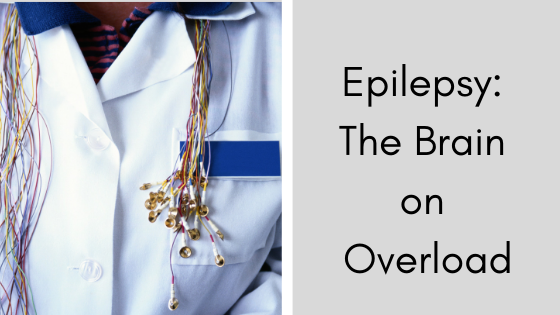 Having a single seizure does not necessarily mean a person has epilepsy. High fever, severe head injury, lack of oxygen — many factors can affect the brain enough to cause a single seizure. Epilepsy, on the other hand, is an underlying condition (or permanent brain injury) that affects the delicate systems which govern how electrical energy behaves in the brain, making it susceptible to recurring seizures. What should you, as a parent, be on the lookout for? There are two forms of energy burst to learn about: those in just one area of the brain (partial seizures), and those affecting nerve cells throughout the brain (generalized seizures). Too often a seizure is mistaken for “daydreaming” or lack of concentration. That can lead to a child not getting the care and attention he or she deserves. Simple Partial Seizures — While aware of what is happening, sadly your child won’t be able to provide any control of body part movement Also things may smell or taste differently to him or her, there may be stomach pain, and naturally, fear and anger will follow. Complex Partial Seizures — In these cases, children may stare, chew, make odd movements, mumble, run, scream— or even see things. The duration may be only two minutes, but kids end up being confused and scared. Generalized Tonic Clonic Seizures — A child abruptly screams or cries. Next, he or she becomes stiff. Falls. Then jerks arms or legs in an up/down or side-to-side movement. Convulsions are the most easily recognized form of generalized seizure. Also look for bluish skin, shallow breathing, clenched teeth, or loss of bladder control by your child. Usually all this takes place in a matter of minutes. Afterward, the child falls into a deep sleep. Absence or Petit Mal Seizures — This is a very tricky one. Often it is mistaken for common daydreaming or even the child just not paying attention. Look more closely. The child is completely unconscious and cannot be alerted or wakened. Might last less than a minute. Atonic and Tonic Seizures — Children suffering from these are the ones you most often see wearing helmets while playing; during these seizures, children collapse and fall. Head injuries are a prime result. Seizure last roughly a minute and then the child regains consciousness and awareness. Myoclonic Seizures — Frustrating as well as painful. These are most common in the morning. Sudden, brief muscle jerks, usually affecting the child’s neck, shoulders, and upper arms. They can be fairly mild or strong enough to make a child fall. They can cause children to drop what they are holding. Knowing what to look for is very important in early diagnosis. Being able to tell apart a daydream state from a full-on seizure could be critical in protecting your child. Did you know that our own Duke University Health system in Raleigh is a “Level 4 Center of Excellence?” That is the highest level of accreditation by the National Association of Epilepsy Centers. The Duke neurologic disorders programs are also consistently ranked among the top programs in the country by U.S. News & World Report. Other local sources you can tap into for more information and assistance are: Epilepsy Foundation of North Carolina; Epilepsy Association of North Carolina; and Epilepsy Alliance of North Carolina.